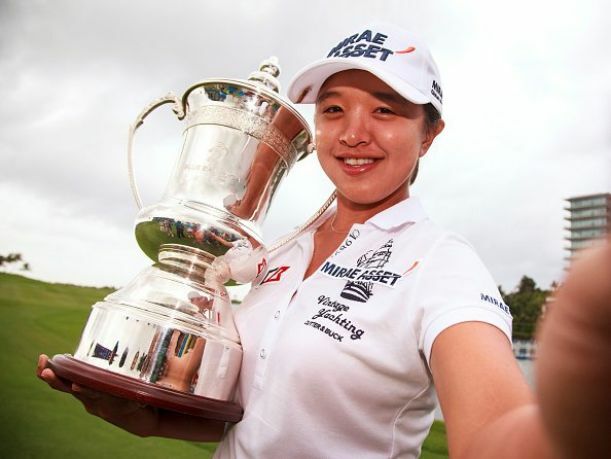 HAINAN ISLAND, China (AP) – Sei Young Kim made a 6-foot birdie putt on the par-5 18th for a one-stroke victory Sunday in the Blue Bay LPGA. The 22-year-old South Korean player won for the third time in her rookie season on the LPGA Tour, closing with a 2-under 70 at difficult Jian Lake Blue Bay for a 2-under 286 total. After high wind sent scores soaring the first three days, the players faced only a moderate breeze on a rainy afternoon along the South China Sea. Third-ranked Stacy Lewis, fellow American Kim Kaufman and Taiwan’s Candie Kung finished a stroke back. Kim holed her winning putt after playing partners Lewis and Kung missed birdie tries – Lewis from 20 feet and Kung from 10. Lewis finished with a 70 for her sixth runner-up finish of the season and the 21st of her career. She won the last of her 11 LPGA Tour titles in June 2014. Kung shot a 71. Kaufman, playing a group ahead, had a 69 for the best round of the day. Kim won playoffs this year in the Bahamas and Hawaii in events also played in strong wind on seaside layouts. The five-time Korea LPGA winner earned $300,000 to move up a spot to fourth on the money list with $1,727,436 and is projected to jump from 11th to eighth in the world. “The first goal is Olympic gold medal. Then my next goal is No. 1,” Kim said. Kim dropped into a four-way tie for the lead on the par-3 17th when she three-putted from about 120 feet on the massive beachside green. Kung hit to 2 1/2 feet and Lewis to 4 1/2 feet, but missed their putts to the right. Kim’s best shot was on the par-4 10th when she holed a 40-foot flop from the rough to save par after hitting her approach long and left into the water. “That chip happened to me, so I trust more that I can win,” Kim said. She pulled even with Lewis with a birdie on the par-4 13th. Kim’s 3-wood drive took a big forward bounce off a cart path, leaving her a sand wedge approach that she hit to 6 feet. Lewis three-putted for bogey, missing a 5 1/2-footer. Kim moved ahead on the par-5 14th when she made a 10-foot birdie putt and Lewis missed an 8-footer. Kaufman had her best finish in her first two seasons on the tour. The 24-year-old former Texas Tech player from tiny Clark, South Dakota, birdied Nos. 9, 11, 14 and 15, then missed mid-range birdie tries on the final three holes. Top-ranked Lydia Ko shot her second straight 70 to tie for eighth at 4 over. She had the best weekend total in the field after opening with rounds of 77 and 75. “I’m happy that everything’s over and I can relax and go back home,” Ko said..
Ko won the LPGA Taiwan by nine strokes last week to regain the No. 1 spot from Inbee Park. The 18-year-old New Zealander has a tour-high five victories. Canada’s Alena Sharp recorded her best LPGA Tour finish in 10 years, a tie for 5th at 3-over.